I am trying to use Gimp (2.8) to convert an mp4 video to a gif. I downloaded and installed GAP (I pasted the resources I used below). Set "To Frame" to 180 (I've tried using different ranges here). 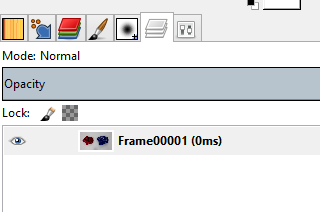 Selected "Create only one multilayer image"
Once I'm back in the main gimp screen, only one frame shows up in Layers. Let's say I select "To Frame" and put in 180 (refer to screenshot below). Then I click "Video Range". In the Video Range screen, 180 is now the "End Frame" (which makes sense). However, if I click on the slider above the video preview in the "Video Range" screen, the "To Frame" and the "End frame" values reset to 1. So, I'm guessing that behavior may be an indicator of whatever the main problem is. Is there a default setting that I need to change somewhere to allow Gimp to covert the video into more than one frame? If not, has anyone else encountered this problem and found a fix? You are almost there. Before you do this make sure your video file is in a folder on its own. Click Video > Split video to frames. Choose the video file. Select the range. Also make sure the output folders are set to the same folder that your video file is in. Click OK and GIMP will import the video. Note that this will show up as only 1 layer in the image window. This is normal! At this point, the folder you have chosen as the output folder should fill with XCF files for each frame of the video. Open the folder and you should see them in there. Click Video > Frames to Image. Select the range of frames to convert. This will open a new image window in GIMP, with the video converted to layers. At this point, you may wish to scale the image to make it smaller, to keep the file size small. Click Image > Mode > Indexed, and choose Floyd-Steinberg (reduced color bleeding) as the dither method. You can select 64 colours to try to keep the file size smaller. Optimise the animation using Filters > Animation > Optimise (for GIF). This will open a new image window with the layers optimised. To export the GIF click File > Export As (or if you are using GIMP 2.6.x use File > Save As), choose GIF as the file type. When the GIF export dialog appears, select the "Save as animation" option. Here's an example GIF I made, with GAP in GIMP, using the above steps, from a sample MP4 file available here. I extracted frames 60 to 100, giving a 40 frame animation. Not the answer you're looking for? Browse other questions tagged gimp gif video file-conversion or ask your own question. The image gets blurred after zoom or scale action in GIMP. How to get clear image?